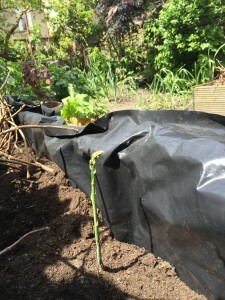 Here is a picture of my new asparagus bed and the first shoots of the new asparagus plants. There are 33 principles in chiropractic. Principle 6 states all processes require time. With asparagus when you plant it you have to wait 3 years before you begin to harvest it. You have to take care of it, allow it to grow and resist the urge to harvest it. This is a tough lesson in time when you consider the care and attention required to keep the plant healthy before it produces. The same can be true of any process. With healing it also takes time. It may not take 3 years to see the difference in your spine healing but it still takes time. According to research it takes about 12 months for a healing process of soft tissues (muscles, tendons, joints, ligaments) at cellular level. Yes your pain will most likely be gone a lot quicker than that, however, if you don’t give it a chance to heal properly there will be a long term price to pay. After your spine has healed time must then be taken to strengthen your spine. This is where a lot of people don’t understand the necessity of strengthening your spine. They are usually going round in circles of relapses each one a little more intense and frequent than the one previous. If you want a healthy asparagus crop year after year it must be taken care of it regularly and the same rules apply for your spine, regular care is needed to keep it healthy. Eat some asparagus this summer and take some time to take care of your health and your spine. This entry was posted on Saturday, July 9th, 2016	and is filed under Latest News.